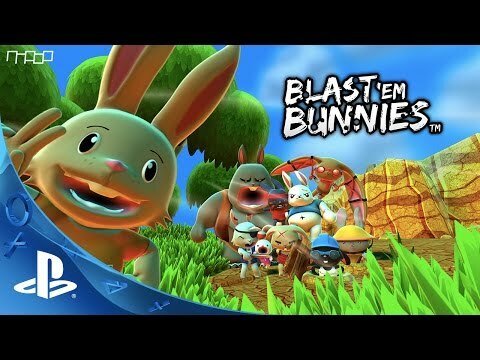 Blast ‘Em Bunnies is a first person endless shooter. Grab your Carrot Rifle, Watermelon Machinegun, Turnip Mortar or Runner Bean Laser and start blasting enemy bunnies. How long can you survive and how many coins can you collect? Can you survive both survival mode and slaughter modes with their unlockable difficulty levels? Survival sees you trying to last as long as you can against harder and harder foes. While Slaughter changes your hearts and weapons to lower quality as you try to survive 2 minutes across Normal, Super and Ultra difficulties! With 4 weapons to purchase and upgrade and a myriad of bullet types to experiment with you are going to need to shoot as many coins as you can to unlock them all! Each weapon features a unique firing type from the standard Carrot Rifle to the fast firing Watermelon Machine gun. With quirky bullets like the heat seeking chili seeds or the freezing cucumber laser beams! Customize the look and feel of the game with downloadable enemy bunny skins and arenas (sold separately and in bundles). With Clowns, Ninjas, Zombies, Luchadores and an Urban Army skins and arenas available there are lots of combinations to whet your blasting appetite! Purchase the Super Mega Bundle for the complete customization package including the full game, all 5 extra skin packs, all 5 extra arena packs and bonus 2x, 5x and 10x coin multipliers. Blast Bunnies and collect coins to upgrade your weapons. Can you defend your burrow from their onslaught? Customize your experience with the Clown, Luchador, Ninja, Urban Army and Zombie skins and arenas. Unlock upgrades faster with the 2x, 5x and 10x Multipliers. NOTE: This bundle includes Blast 'Em Bunnies, all 5 skin packs, 5 arena packs and 3 multiplier packs. Blast 'Em Bunnies © 2015 Nnooo. All rights reserved.